Hours ago, Dato Dr Lim release the map for Tristate 2015 on Facebook (link), and I’ve try to plot as near as possible to the map that he shared. After looking at the overview, my legs lembik already. Omg.. For the past 2 months in dormant hibernation mode, didn’t cycle more than 20KM and got this ride in less than 10 days. Really ho seh now. Total distance is 120KM as per registered but the actual distance might have 10-20KM extra due to some road leveling. From the map, the start is from Juru Auto City and will be having about 28KM riding along the city road before entering the “jungle route”. So it will be expect to have cars and motor bikes traffic in the first 28KM. The fun part begin now! Country road type of riding route for about 65KM when start from Kulim heading to outskirt township like Serdang, Selama, and Mahang. Expect to reach back in Kulim in around 94th KM. If you able to maintain average speed of 28KM/H, then it will be around 3 and half hour to reach. If ride slower than 24KM/H then it gonna be 4 hours before reaching this place. 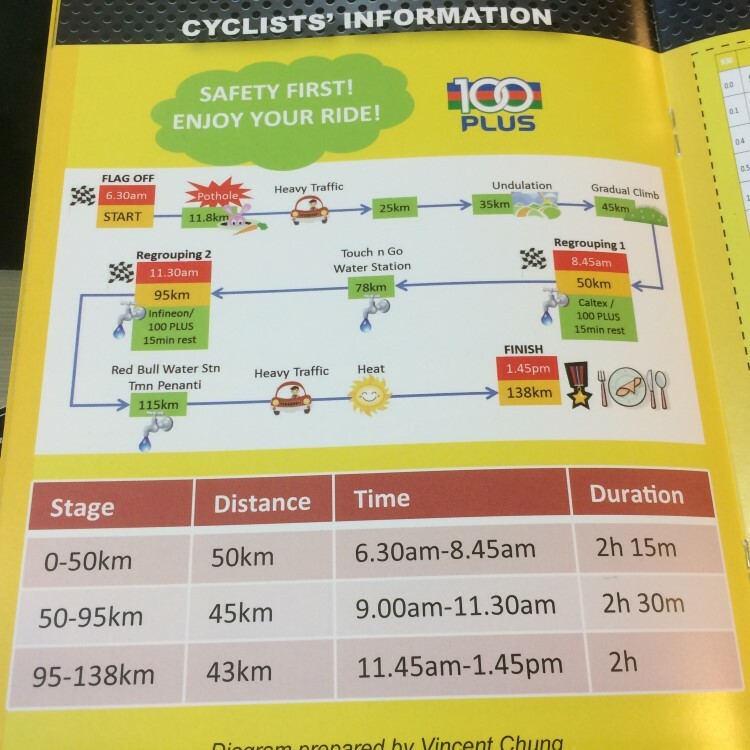 Which mean if the event start on 6.30am sharp in releasing the riders to the road, it will be 10.30am now. If lucky day, it might have good cloud and give you cooler weather, else at that kind of time it gonna be scotching hot die father mother kao peh kao bo. From 94th KM onward, it will be riding back to city road and expect to share road with traffic that will be slow down riding speed due to safety concern. Look back again, really sweat gao gao. I think I’m gonna get sweep away by the sampah lorry. But nevertheless, just try my best to push as far as my legs can go. Enjoy the ride, if kena sweep or out of cut off time no medal also nevermind, at least get the fun to join in this grand event. Hahaha! Here’s overview for the event schedule. Beware of this turning point that might be easy to be missed out, the 136 to K907 turn. The first turning point when out from Kulim Hi-Tech. You will see a Caltex after the turn, if you passby the Caltex station then you are overshoot already. Turn to the left just before the Caltex. Below are the stage split. There will be 2 regrouping, first is at 50KM, second at 95KM. From the time allowance, you could see that, to reach first regrouping point, your average speed must above 23km/h (22.2km/h to be exact). And second regrouping will need you to have an average speed above 18km/h for 45KM ride. Expect for rolling hill before second regrouping. Last stage is ride toward finishing line for 43KM, average speed must above 21.5km/h. Sandra, Cycling Malaysia Magazine Album 1, Album 2, Album 3, Edward Yeoh, Edwin Lim.